Featuring the most impressive wave-like design, this outstanding luxury family beach resort is standing tall in one of the most sought-after locations in Dubai. Instantly recognisable, this magnificent hotel boasts a wealth of facilities, such as a private beach, Pavilion Dive Centre, six swimming pools, and the fantastic Sinbad Kids’ Club. There's also unlimited access to Wild Wadi Waterpark, and a complimentary shuttle service. 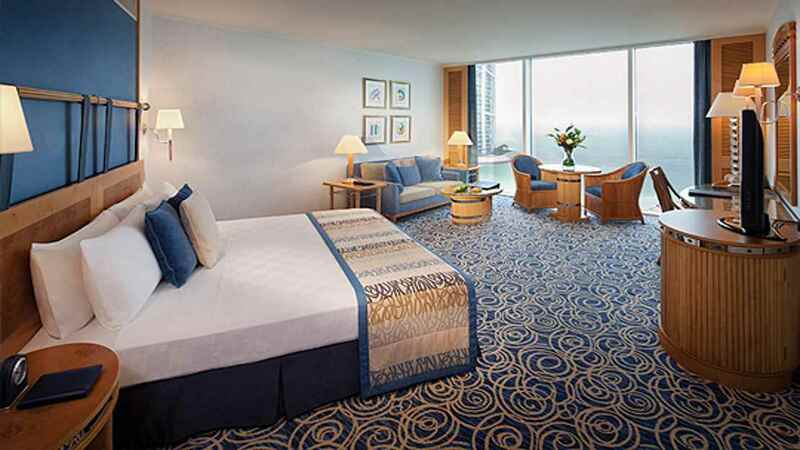 Jumeirah Beach Hotel features rooms and suites filled with luxury amenities and boasting magical views. Beachside villas offer a peaceful hideaway, and promise to deliver an even more luxurious experience for privileged guests. Don't forget the enriching services of the award-winning Talise Spa to complement the tranquillity of a superb beachfront location. The pristine sands of the private beach are about 2-minute walk away. 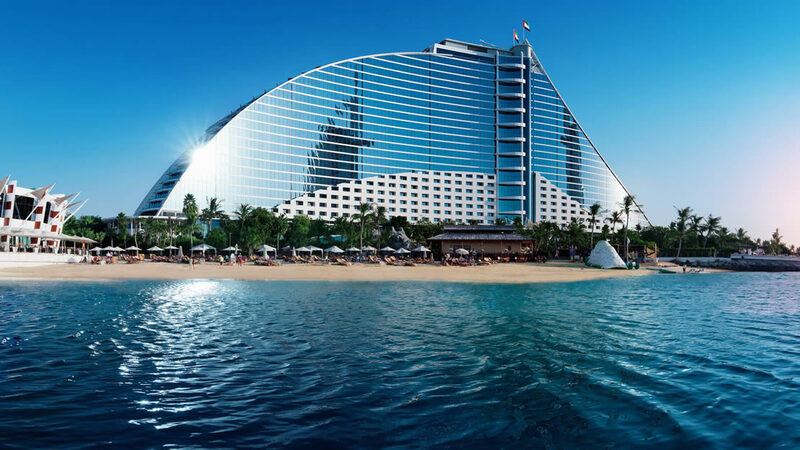 Jumeirah Beach Hotel is a resort with a wealth of swimming pools, shopping, restaurants, cafes and bars to try throughout your stay. If you do fancy venturing out, Souk Madinat Jumeirah is a pleasant 10-minute stroll away, and don’t miss the turtle rehabilitation centre. Alternatively, Downtown Dubai is approximately 15km away, and there’s a free shuttle to a selection of Dubai’s top shopping malls. 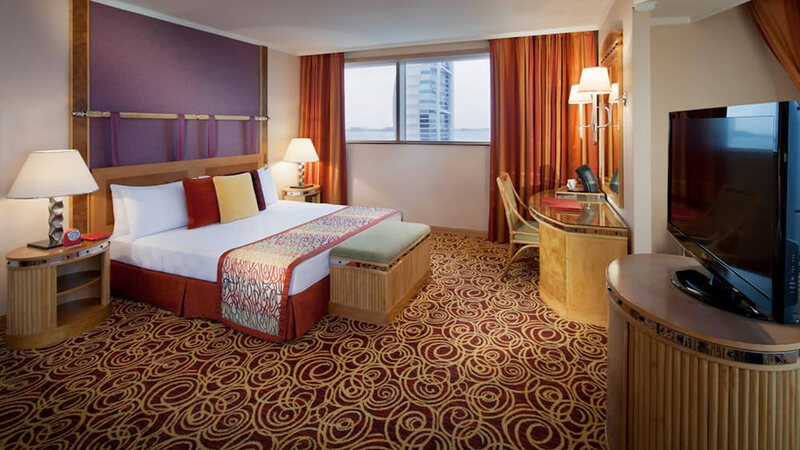 Dubai International Airport is approximately 25km away from Jumeirah Beach Hotel. 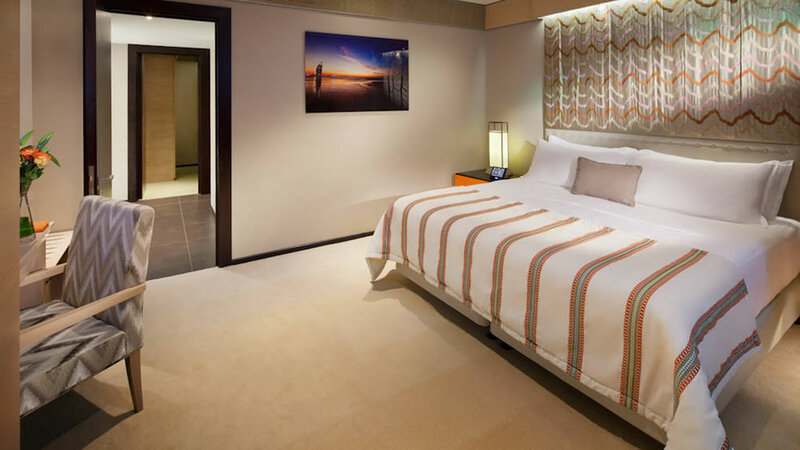 The beautifully spacious rooms feature king-sized or twin-beds, a seating area and amazing views of the Burj Al Arab, hotel marina and ocean from floor-to-ceiling windows. 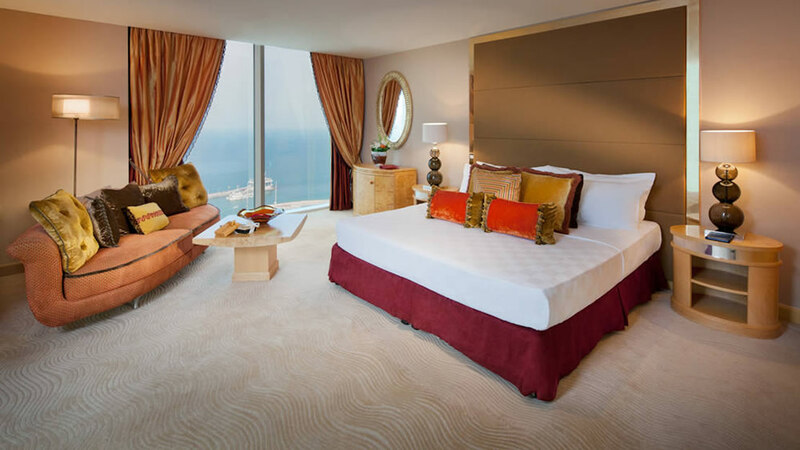 What a way to start the day, Ocean Deluxe rooms allow you to enjoy the stunning views of the Burj Al Arab and tranquil ocean from the moment you wake, with sumptuous beds facing the floor-to-ceiling windows. Beautiful bathrooms, standard amenities and a maximum occupancy of 2 adults and 2 children applies to this category. 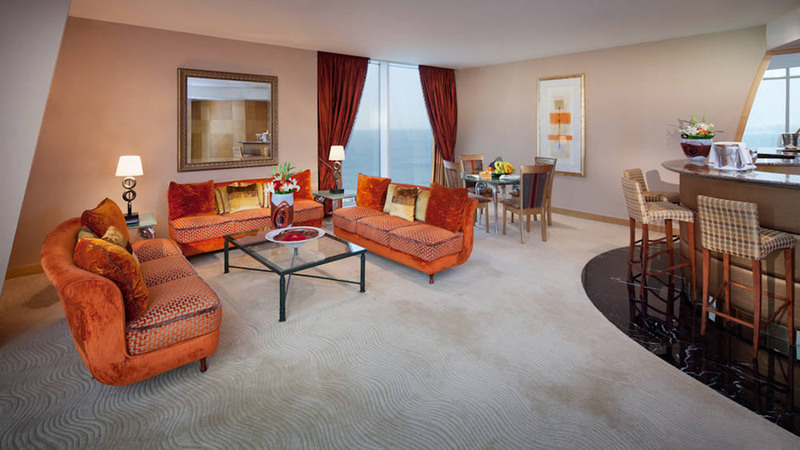 These fabulous rooms offer uninterrupted views of the pristine beach, Arabian Gulf and Burj Al Arab. Fifty square metres of comfort accommodates 2 adults and 2 children, while guests also have the choice of accessing Premium Leisure Club (family-orientated) or Club Executive (over 18s only) benefits. 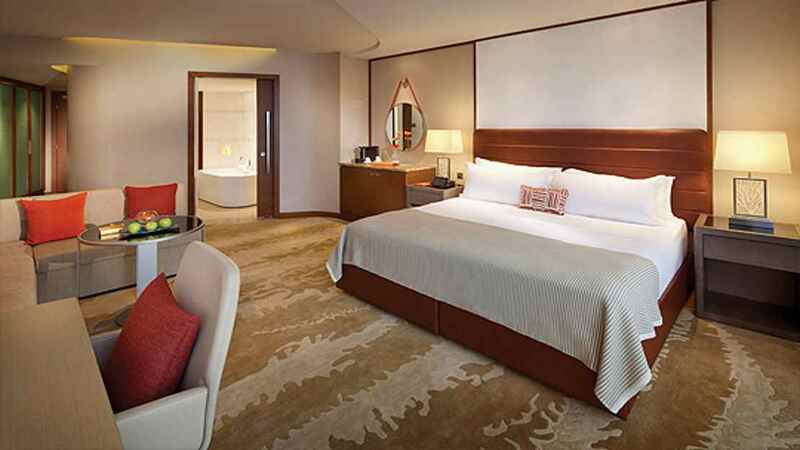 Whether you’re enjoying a relaxing family stay or travelling for business purposes, these wonderful rooms are the ideal choice for fabulous Dubai views and a range of superb amenities. Guests also have the choice of accessing Premium Leisure Club (family-orientated) or Club Executive (over 18s only) benefits. 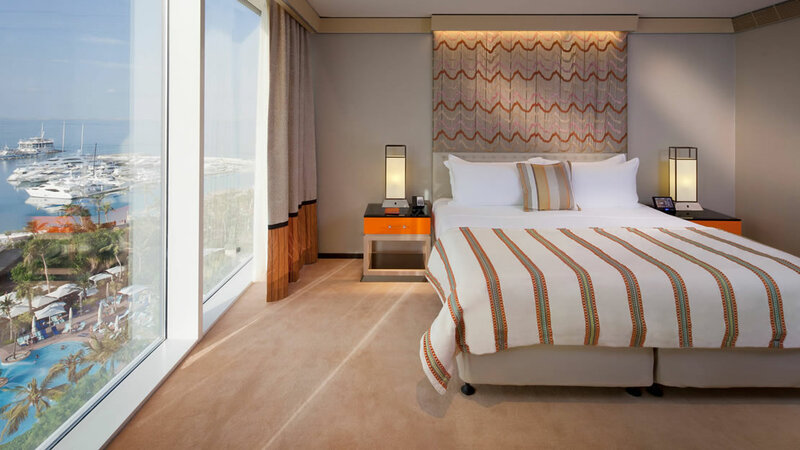 Offering an excellent mix of business convenience and Premium Leisure Club advantages, these wonderful rooms continue the luxury theme, along with spectacular views of the Arabian Gulf. A stunning 105 square metres offers plush accommodation for up to 2 adults and 2 children. 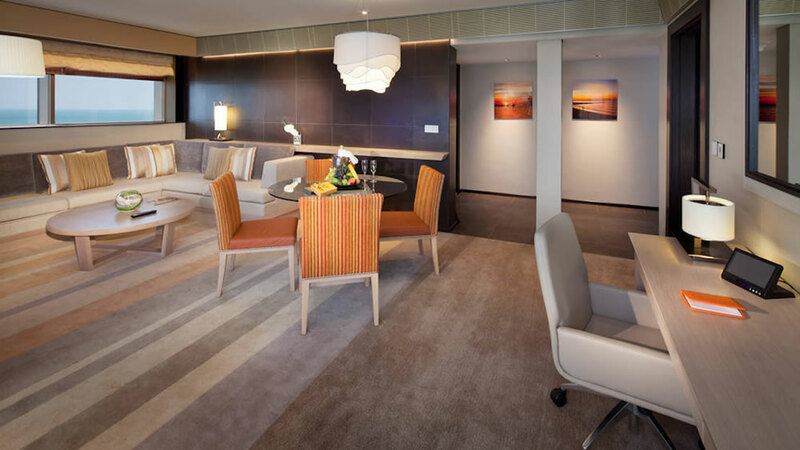 As well boasting a sitting and living area, these suites also feature a stunning terrace, which is ideal for dining and looks out over the ocean, the Burj Al Arab and the marina. Guests staying in these suites also have the choice of accessing Premium Leisure Club (family-orientated) or Club Executive (over 18s only) benefits. Starting at 128 square metres, these beautifully appointed suites feature a large living area, charming sun terrace and cater for up to 2 adults and two children. Guests staying in these suites have the choice of accessing Premium Leisure Club (family-orientated) or Club Executive (over 18s only) benefits. 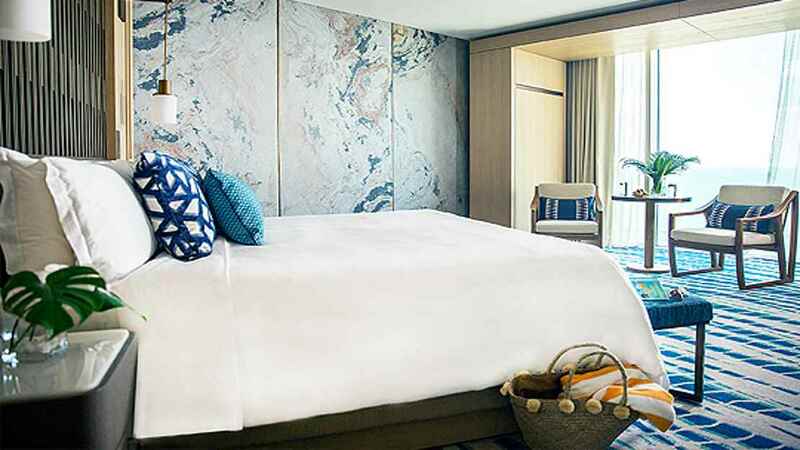 Continuing the theme of luxury and design of the One Bedroom Ocean Suite, these rooms offer a generous 162 square metres of accommodation and accommodate up to 4 adults and 2 children. Guests staying in these suites have the choice of accessing Premium Leisure Club (family-orientated) or Club Executive (over 18s only) benefits. Relax in an exceptionally generous 215 square metres of accommodation. Fantastic views, three private bedrooms, and a beautiful lounge area ensure all the family's needs are catered for, allowing privacy and relaxation. A large furnished sun terrace and access to Executive (over 18s only) and Premium Leisure (family-orientated) Clubs are available with this suite. A generous 162 square metres of decadence awaits privileged guests of this class. 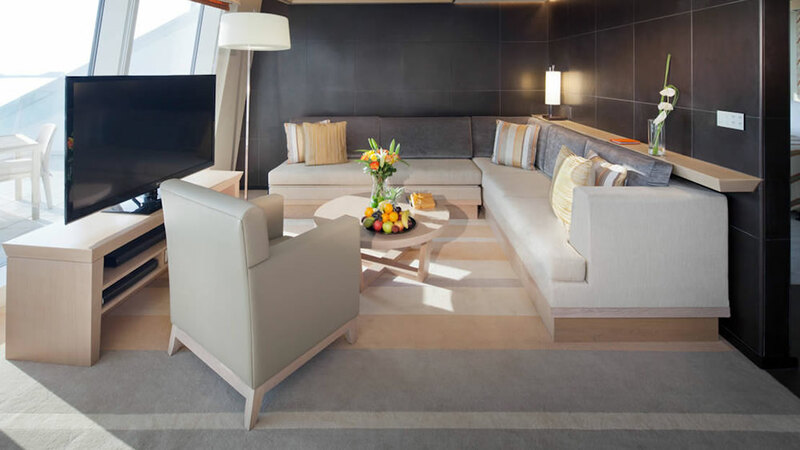 Relax in contemporary space with the Burj Al Arab and clear blue sea framed by floor-to-ceiling windows. There is one king-size bed in the master, and twin beds in the second bedroom. Guests staying in these suites also have the choice of accessing Premium Leisure Club (family-orientated) or Club Executive (over 18s only) benefits. 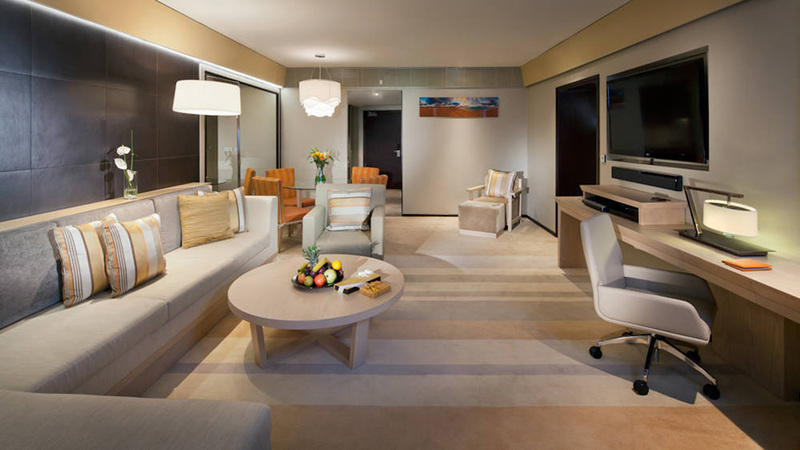 Located over two floors, this beautiful Presidential Suite is a haven of luxury and privacy. A separate living and dining area with full bar counter and terrace area creates an impressive ambience. A private upper floor features a large master bedroom with king-size bed and en-suite bathroom. Guests staying in these suites also have the choice of accessing Premium Leisure Club (family-orientated) or Club Executive (over 18s only) benefits. A beautiful suite comprising king-size and twin beds, a large living area with spacious terrace and stunning bathroom, plus high-end amenities, these rooms can accommodate 2 adults and 2 children. Access to the family-orientated Premium Leisure Club applies and there is complimentary access to Sinbad’s Kids’ Club. Grand and decadent with a high level of detail, this superlative Beit Al Bahar Suite is a majestic display of luxury to the highest degree. As well as featuring an expansive terrace and plunge pool, this beautiful villa combines Arabic-influenced décor with opulent furnishings such as 18 carat gold-plated bathroom fixtures, and a sunken circular bath. Guests staying in this villa have access to Premium Leisure Club (family-orientated) or Club Executive (over 18s only) benefits. With a generous 220 square metres of sheer decadence this exquisite villa is a perfect choice for up to 4 adults and 2 children below the age of 12 years. Refurbished and incorporating two private bedrooms, an expansive terrace, plunge pool and a superb living area, this is the crème de la crème of Jumeirah Beach holidaying. 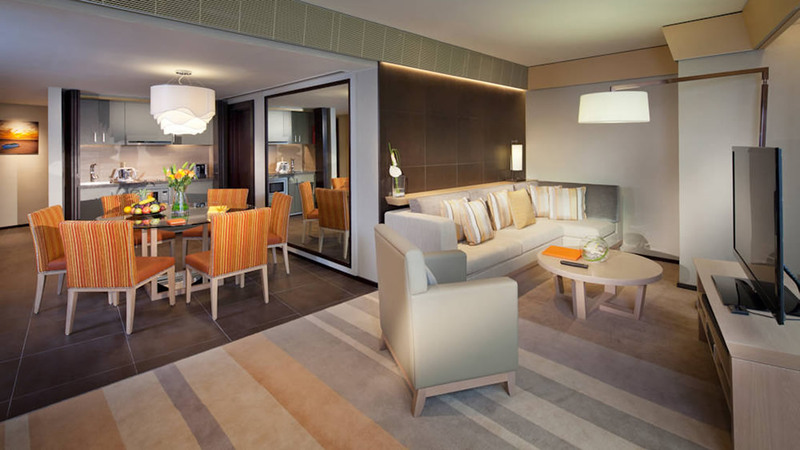 Offering all the elements for a relaxing family stay, these rooms feature 50 square metres of comfort. There is a seating area perfectly positioned in order to enjoy the fabulous Dubai views and a range of standard amenities. For business travellers and families, Jumeirah has developed these exclusive benefits to make your stay even more luxurious. Details may be subject to change. You will be provided with full details of the privileges on arrival at the hotel. This is a stylish venue serving a delicious array of healthy choices without compromising on flavour. Latitude is a wonderful venue serving a selection of the finest cuisine from all around the world. Choose from classic Mediterranean, Japanese, Chinese or Arabic delights. With a casual dining approach, this is an outdoor venue where beautiful views of the yachts moored at the marina and the Burj Al Arab set the scene. Delicious afternoon teas are served in this beautiful lobby lounge area. Savour delicious lunches and dinners showcasing the best Mediterranean cuisine. Enjoy Pan-Asian delights in a romantic setting. This venue is ideal for couples and families with plenty on the menu to suit any age. Dhow and Anchor is an award-winning gastropub with a large terrace area. Casual dining and plenty of beverages, this is an exceptional venue. Just steps away from the pool, and next to the marina, this is a stylish venue where cocktails and all manner of refreshments can be enjoyed, against the gentle tunes of chill-out music. At the end of Jumeirah Beach Hotel’s walkway is this chic late-night venue which plays host to guest DJs and lots of house music. Vibrant Latin American cuisine and lively entertainment is the theme here. North Indian classics are served in this richly decorated venue, an intimate and luxury retreat. Hearty Italian in a stylish Tratorria, Carnevale is a welcoming venue perfect for socialising with family and friends over delicious cuisine. This stunning restaurant features red brick arches, wine barrels and solid oak creating an intimate setting in which to enjoy sizzling meats. Enjoy tropical grilled food Polynesian style in this fantastically elegant setting. Enjoy light lunches, main signature dishes and a vast selection of refreshments alongside the pool in this casual venue. Situated on the 24th Floor, this fabulous cocktail bar provides spectacular views and welcomes guests to a stylish and memorable evening. Enjoy handcrafted cakes, delicious desserts and freshly-made bread at this innovative bakery. Savour a taste of the Mediterranean at this stylish beachside lounge. Relax beside the pristine private beach and sample a variety of tapas-style dishes and light bites. Sit back and watch the sun go down, as you enjoy mouth-watering tapas and sip one of the signature drinks or refreshing mocktails. For a full list of restaurants included in the dine-around experience click here. Details may be subject to change. You will be provided with full details of the dine-around programme on arrival at the hotel.